Okay, so Aralia is not a dumb blonde at all (though she does talk a lot), but dums and teks are what belly dance music is made of. 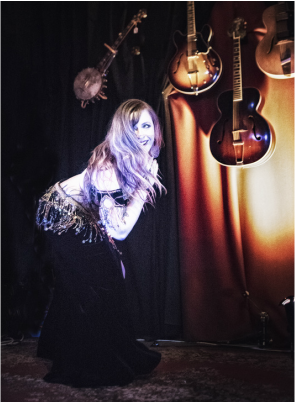 Mixing a sense of humor with graceful lines, Aralia is a crowd favorite at local Western MA venues including: The Goddess Lounge, Cairo Cabaret, The Bellydance Connection, and more. Aralia is a proud student of Sahina Bellydance, a member of the Crescent Dancers, and one spunky half of Eidetic. She believes most things in life can be fixed by adding a little bit of glitter and one giant zaghareet. Aralia is based in the Pioneer Valley in Western Massachusetts. Aralia really believes that everyone can dance. The beauty of belly dance is that it looks different on every body. It's not about copying someone else, but discovering how movements feel on your body. Because of this Aralia's performances and classes are always a safe space where negativity toward self and others is not allowed. The whole point, my darlings, is to have fun! Interested in learning to shake it? Click here. You can also inquire about performance here. Aralia is one of Sahina's advanced students and has been with her since her first step into the belly dance community. Falling madly in love with the dance (and the community it brought with it) once Aralia started dancing she found she couldn't stop. Aralia is a proud supporter of love in all forms, people of all types, and a community that is silly, honest, and kind. Do not hesitate to contact Aralia to add something tailored especially to your needs for your next occasion.